In case you missed it yesterday, I am posting a picture every weekday (5 days) in celebration of our 5 year anniversary this Friday! 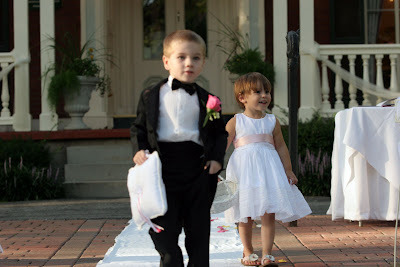 Meet Kelly and Joe, our flower girl and ring bearer. 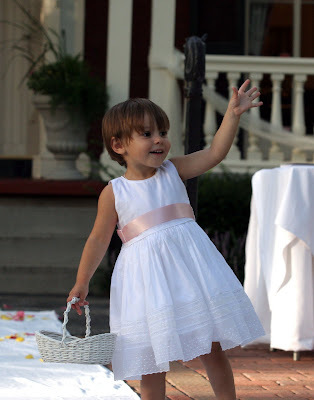 When Kelly started down the aisle and realized that she had the whole crowd's attention, she stopped and started Ms. America waving to her adoring fans. Little show stealer! How was I to follow that? Doing his duty, Joe went back for her after a few minutes of waving and they held hands the rest of the way down. I was adamant about NO VIDEO at our wedding but I sometimes wish I had this moment on the movie film. Happy 5th anniversary!! 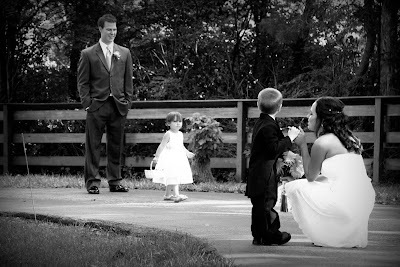 :) Love all of the pictures (your flower girl was adorable). Also, wanted to let you know I'm now a proud member of OhLife.com. I always loved your daily journal idea but mine have never lasted more than a week. This just seemed so easy (and it is) and so far so good! Thanks for telling us about it! ha! I forgot about the waving! Love it! love love love the black & white!! !